I do not plan on reviewing many books geared to kids younger than seven, but if I do, I will mention that the book is safe for all ages. I’d also like to say that rating systems in general are flawed and art is subjective, so what you consider a 17+, I might consider a 13+ and vice versa. Take these ratings with a grain of salt, and please read anything that you give a kid. With that being said, please offer feedback on the rating system. Is it good? Bad? Accurate? I will also be compiling a list of the books that I review with links to the reviews because when we get to day 116, you might not want to scroll through every review to see what books I’ve done. More into to come on that! I got this book on a recommendation from my guy Adam (@mratomabort). I’m in a text conversation with a bunch of my comics peeps, and we share titles that we dig. I suggest you do the same thing! It helps find cool new books. Anyway, Adam told us to go read this book, and after a quick Amazon two-day ship, it was at my house, and I read it. Holy cats…this is not a simple kid book. 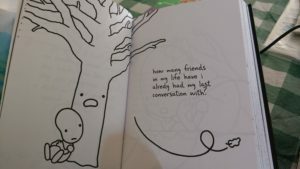 This book got deep quickly! And I loved it. 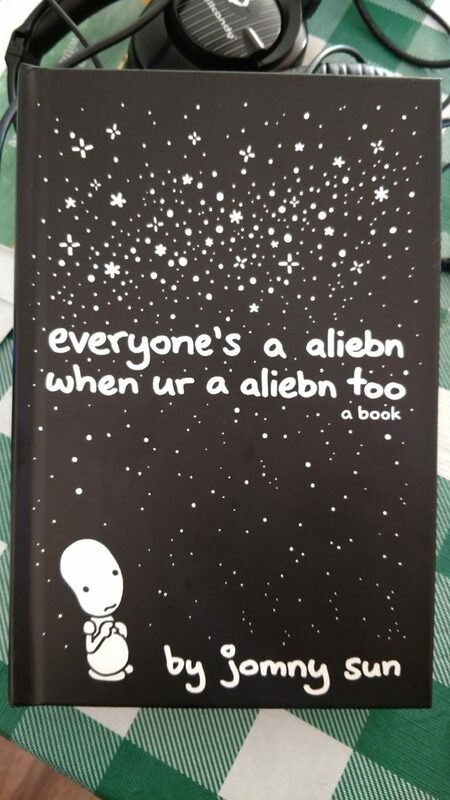 This book, about an alien sent to research humans, uncovers the deepest fears, desires, and pressures of being alive. I would be lying if I said that I wasn’t moved to tears more than twice while exploring this book. And the fact that it is so simply done is the cherry on the sundae. This book proves that you do not need complex story, complex words, or overly complex images to make people think about their humanity. When I handed the book to my wife, she immediately thought of it was a kid’s book, like I had. However, after two minutes with it, she was in it for the long haul. Texting pictures of pages to her best friends, family, and co-workers. When I started thinking about this project, I went and wrote a few reviews to keep ahead of myself, and I was going to start my first twenty days with those stocked reviews, but after reading everyone’s a aliebn when ur a aliebn too, I realized that I can’t put off reviews of books that move me like this one does. I’m excited to bring this title to you. You should go pick it up. You should read it by yourself because, if you have a soul, you will get emotional, and you might want peace in your reflection.